The teaser poster shows the October 15 launch date and "Do not call LEX, my name is Mi Note 4" message. Xiaomi is expected to launch the Mi Mix 3 on October 15. But it seems like Mi Mix 3 won't be the only device launching on the said date. As per reports, the company will also be launching another smartphone named as Mi Note 4 alongside Mi Mix 3 on October 15. A company executive has shared a poster on Chinese micro-blogging site Weibo. The poster reveals that the second phone launching on October 15 is the Mi Note 4. 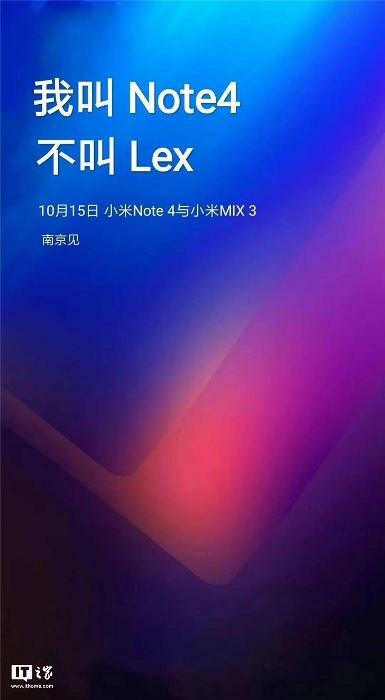 The teaser poster shows the October 15 launch date and "Do not call LEX, my name is Mi Note 4" message. This Mi Note 4 phone is originally known as the Xiaomi LEX and LEX is the codename for the phone. The Mi Note 4 is the successor to the Mi Note 3 which was launched last year in September. At the moment, not much is known about Mi Note 4 except for a screenshot that it has a dedicated Xiao AI assistant button. Additionally, the poster also has a colour gradient background, so it is expected that the smartphone might be available in this colour. The device is also expected to be powered by a Qualcomm Snapdragon 710 chipset. As per earlier rumours, the Mi Mix 3 will feature an all-screen bezel-less display, Snapdragon 845 chipset, wireless charging and native 5G support out of the box. The phone is also said to have a slide front camera which pop-out using a sliding mechanism similar to the Oppo Find X camera. Sadly, there is no information about the specifications and features of the upcoming Mi Note 4. So we suggest you stay tuned with us for further details. Note: The Lead Pic is of Xiaomi Mi Note 3.